Ola Shekhtman's sterling silver skyline rings let you wear your favorite city around your finger. Celebrate your favorite city by keeping it wrapped around your finger. Ola Shekhtman combines art and technology to let you do just that. "During my life I traveled a lot and always wanted to keep my impressions from significant moments with me," Ola explained. When she couldn't find rings featuring the buildings and landmarks she wanted to remember, she made her own. 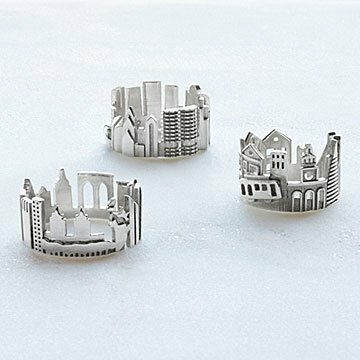 Ola's tiny cityscapes start as 3D-printed designs, then they're cast in sterling silver. Each ring features details that will remind you of the city you love—like New York's Brooklyn Bridge, The Chicago Bean, and Seattle's Space Needle. Made in New York. For a list of all the landmarks and buildings featured on Cityscape Rings, click here. “During my life I traveled a lot and always wanted to keep my impressions from significant moments with me,” says Ola Shekhtman. Ever since she was a kid, she wanted to find a ring to celebrate the places she loves. “I wished to have a ring with buildings wrapped around my finger, but I’ve never found one.” So, she made one instead. Ring felt very light and of poor quality. Cute idea. Poor execution. Wish it was sterling silver. Only wish that it came with descriptions of the structures. The detail on this ring is so beautiful! Others said it ran small, but I think it's pretty true to size. And obviously you have to be careful when you were wearing it due to the Washington monument! Gorgeous and unique little ring. I got Chicago, which is where I live. Very comfortable, doesn't poke me at all. My only quibble is that I wish it were a little thicker, since it is starting to go oval on me and I've only had it a few weeks. Hope it won't crack or can be repaired if it does. Enjoy wearing it. Good purchase. Haven't found anything about it that I dislike. Received compliments. Let me start by saying the ring is fantastic. I love it and pointed it out originally to my husband for a valentine gift. It came and it looked just as fabulous in person as online. The size I had him order is my normal ring size. Way too small. I went on the site to see if there was a measuring process and was unable to locate one. Returned the 7 for an 8. Too small. Returned again and got this one-the 9 and it fits great. Size would be my only caution otherwise the ring is fantastic. This is a conversation starter, a celebration of our courtship and marriage, a song to our grandchildren. Nelson Algren said that you love Chicago but it does not love you back. he needed this ring. Once a Chicagoan. . . This ring is a beautifully crafted architecturally accurate depiction of Chicago's buildings and attractions. Love it! Love this ring. . .but you need. . .